Learn more about adding external content to your messages by using the #Listrak\Content url=""# tag. The Content URL system tag is used to insert and display external web content within a message when a message is sent. 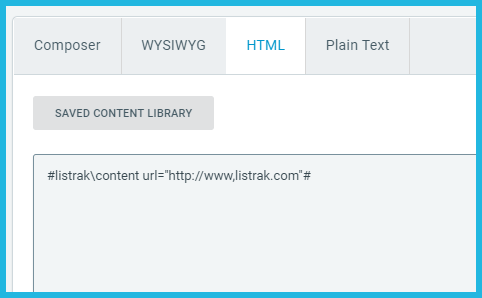 Use this feature by inserting the #listrak\content url=""# tag into the message creative. When the message sends, the tag is replaced with the source code of the page the URL is being referenced in your tag. NOTE: Adding external content to a message using the content URL cannot be personalized for each contact using personalization tags. NOTE: It is important that the images and links on the page that you are embedding use absolute URLs rather than relative so the content will display in the email.